The Cocos (Keeling) Islands in the eastern Indian Ocean are the only atoll that Charles Darwin visited during the voyage of the Beagle.Darwin had developed a theory that gradual subsidence of volcanic islands in the tropical Pacific Ocean would lead to the progressive formation of fringing reef, barrier reef, and ultimately a coral atoll. His short visit to Cocos in 1836 provided him with the opportunity to look for support for his theory, and became central to his theory of coral reef development. His fellow sailors convinced him that undercutting of coconut trees and erosion of the shoreline (Fig. 1) were 'tolerably conclusive evidence' to substantiate his view. Darwin's theory of coral reef development was enthusiastically accepted on his return to England, and his first major scientific paper and his 1842 book focused on coral reefs (Darwin, 1842). 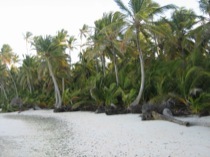 The Cocos (Keeling) Islands had been settled over a decade previously by John Clunies-Ross, a Scottish entrepreneur. Clunies-Ross was absent from the atoll at the time of Darwin's visit, but in contrast to the glowing reviews following the publication of Darwin's book, Clunies-Ross wrote a scathing and vitriolic critique of the book. Mistakenly attributed to the Antarctic explorer James C. Ross, the review appeared in a Dutch journal, 13 years after publication of Darwin's book. Clunies-Ross was evidently concerned by the insinuation that the islands of which he had recently taken possession might be about to disappear below the sea. He wrote that 'a moderably attentive investigation of the Cocos islets affords ample reasons for believing that they have stood up to the present time above the level of the ocean during hundreds if not thousands of years' (Ross, 1855, p.9). The reef islands that occur around the rim of the atoll are low-lying and sandy, generally 3-4 metres above modern sea level. The islands sit on a conglomerate platform, composed of cemented coral boulders and other calcareous skeletal material. 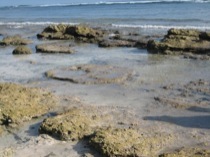 Radiocarbon dating of corals from within the conglomerate indicates that the platform on which the islands sit is composed of corals with ages of between 4000 and 3000 radiocarbon years BP (Woodroffe et al., 1990; 1994), and that the islands have accumulated above the conglomerate during the past 3000 years (Woodroffe et al., 1999). Our detailed surveys have also revealed fossil corals that are in growth position (Figs. 2 and 3) but which are above the highest elevation to which modern corals can grow (Fig. 4). In particular, flat-topped corals, called microatolls, record this upper growth level (Smithers and Woodroffe, 2001). These corals are unable to grow upwards any further because they are exposed at the lowest tides, so the corals grow laterally, living only around their perimeter (and looking like a minature coral atoll). 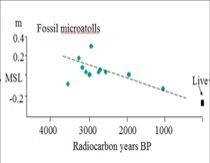 Radiocarbon ages on fossil microatolls indicate that the sea was 50-80 cm higher than present about 3000 years ago, and that the level of the sea has since fallen relative to Cocos (Fig. 5). This is in contrast to what might be expected based on Darwin's subsidence theory, which would imply that the atoll was gradually sinking and that the level of the sea should have risen with respect to the atoll over recent millennia. Darwin's theory has been broadly substantiated by geological observations, including deep drilling on Pacific atolls whose volcanic basement sits at hundreds to thousands of metres below sea level. His theory applies over millions of years and explains the structure of corals reefs. However, there have also been substantial variations of sea level associated with Quaternary ice ages of about 100 m amplitude that have been superimposed on the longer-term pattern of subsidence. The fossil corals that are above present growth limits reflect these millennial-scale sea-level variations, and appear to result from complex isostatic response of the earth to the redistribution of water from melt of polar ice to the ocean volume. 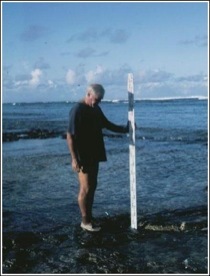 There are many parallels between Darwin's interpretation of short-term erosion as an indicator of longer-term processes and the present debate about the possible impact of sea-level rise and the probability that islands on the rims of atolls will disappear in response to global warming and sea-level rise. There appears to be frequent pre-supposition that any sign of erosion foreshadows the ultimate demise of reef islands. Observations of shoreline erosion are frequently interpreted as evidence for the vulnerability of these islands and their imminent disappearance below the sea, despite continued production of sediment on adjacent reefs and evidence for accumulation of sediment elsewhere around islands. Many processes are operating, but at different time scales. THe erosion shown in Figure 1 is a local phenomenon that contrasts with deposition on shorelines elsewhere on the atoll. The modern microatolls in Figure 4 have been growing for about 100 years and have experienced only small changes in sea level over that time. The islands have accumulated over several thousand years, as Clunies-Ross inferred, whereas gradual subsidence proposed by Darwin occurs at an imperceptible rate, but explains the overal structure and geological evolution of coral atolls over millions of years. Darwin, C. (1842). The structure and distribution of coral reefs. London, Smith, Elder and Co.
Ross, J.C. (1855). "Review of the theory of coral formations set forth by Ch. Darwin in his book entitled: Researches in Geology and Natural History." Natuurkundig Tijdschrift voor Nederlandsch Indië 8: 1-43. Smithers, S.G. and Woodroffe, C.D. (2001). "Coral microatolls and 20th century sea level in the eastern Indian Ocean." Earth and Planetary Science Letters 191: 173-184. Woodroffe, C.D., McLean, R.F., Polach, H. and Wallensky, E. (1990). "Sea level and coral atolls: Late Holocene emergence in the Indian Ocean." Geology 18: 62-66. Woodroffe, C.D., McLean R.F. and Wallensky, E. (1994). "Geomorphology of the Cocos (Keeling) Islands." Atoll Research Bulletin 402: 1-33. Woodroffe, C.D., McLean, R.F. Smithers, S.G. and Lawson, E. (1999). "Atoll reef-island formation and response to sea-level change: West Island, Cocos (Keeling) Islands." Marine Geology 160: 85-104.